SEVERE Karmic Booms Striking Racist, Morally Repugnant NZ! The quake, centered in the Puysegur area (47.93ºS, 165.46ºE), in the south-west, about 260 km SW of Riverton, occurred at a depth of 12km and was felt as far away as Invercargill and Stewart Island, GNS said. The number of addicts hospitalised for synthetic cannabis use has nearly doubled over the past two years to 84, Ministry of Health figures show. Three children were among the 46 people hospitalised after using the drug in the previous year (2016 – 2017). A fatal two-vehicle crash occurred on SH12 near Paparoa, Northland at about 4.10am today. One person was killed and another person was transported to hospital with “serious” injuries. Our obsolete Defence Force has known for months that toxic chemicals could have contaminated local water supplies near two of its [outrageously expensive to maintain] air bases, a report said. The bloom has caused Great Lake Taupō District Council to close multiple beaches near Taupō, and the swim leg of an Ironman event being held on Saturday has been cancelled. The council has also shut down water supplies to 600 properties in several settlements over fears of toxic algal bloom. New Zealand airports including Auckland and Wellington airports are still using a toxic firefighting foam, in case of aircraft fire emergencies. The FAKE Freedom of Information: Police Censorship = NO Information! One person was killed in a crash between a vehicle and a truck on State Highway 1, near Moneymore Road. Police confirmed a person was killed in the crash, while others were taken to Dunedin Hospital by helicopter. The victim was a 51-year-old John Patrick Bonner who lived in Te Atatu Peninsula. In yet another rare admission, police has finally confirmed that a 16-year-old male window washer who was struck by a vehicle on Great South Road on 27th November, allegedly receiving critical injuries, has deceased. The quake occurred at a depth of 74 km, with 8,842 felt reports received by Geonet. Leaving New Zealand, the sinking ship! Massey University staff: Time to quit! You don’t know how lucky you’re! Consider the circumstances as a gift of life! HAVE WE FINALLY STARTED THE GREAT EARTHQUAKE AWAKENING? Nature Giveth, Nature Taketh Away! We’ve decided to put you out of your misery, well half of your misery! It won’t just be ‘Japan 2011’. It’ll be more like Japan 2011 x 30. A car crashed into a power pole on Monday, cutting electricity to almost 2,000 homes. Whatever your pathetic excuses might be! There’s something morally wrong about representing perpetrators of genocide! “Green MP Golriz Ghahraman worked as part of the legal defence team for Bosnian Serb wartime leader Radovan Karadžić,” a report said. FAKE Freedom of Information: Police Censorship = NO Information! 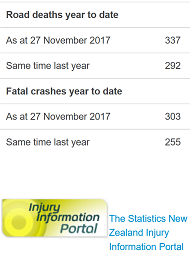 Only FOUR of at least 23 serious crash reports allowed by police since Sunday, despite numerous people being critically, or seriously injured…and NO fatalities??!!! Police Road Fatality Reports: Extreme censorship is in effect for tourism and commercial reasons. Of those fatalities reported by police, many are statistically resurrected by the Ministry of Transport (MoT). Of course, the death wasn’t registered as a road fatality!! What if there were others killed as a result of the crash? Would they also be kept out of the official toll? 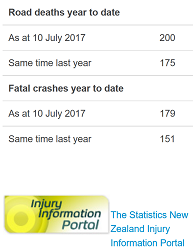 Of an estimated 2,500 people who have received near-fatal, critical, or serious injuries on New Zealand roads so far this year, less than a handful have perished from their injuries, according to NZ police reports, or lack thereof. Woman killed in Christchurch after crashing into a fence on Nov. 27 has not been included in the official road toll. At least THREE road fatalities that occurred over the Nov 24 – 26 period [insider information] were NOT reported by police. No. of known STATISTICAL RESURRECTIONS performed by MoT on Nov. 8, 2017 : at least ONE. As of Monday, Nov. 6, at least FIVE additional fatalities that occurred over the weekend remain unreported by police. No. of known STATISTICAL RESURRECTIONS performed by MoT on Oct. 24, 2017 : at least THREE. On Monday, August 28, police reported at least THREE road fatalities. All three victims seem to have been statistically resurrected by the Ministry of Truth (Minitru). At least FIVE, possibly as many as SEVEN, people were killed in serious crashes on Wednesday, August 23, according to a informed source, but only three fatalities were reported by police. Both the actual number of road fatalities and cases of statistical resurrections performed by the Ministry of Transport (MoT) over the September 22-24 weekend remain UNKNOWN. Between September 18 and 21, 2017 at least SIX road fatality victims were resurrected by MOT. At least nine road fatalities occurred over the weekend (September 1 – 2), according to reliable insider information. However, only four of the deaths were reported by police, and of those, just three were recorded by the Ministry of Transport. Did you know Peter Thiel screwed the NZ taxpayers out of tens of millions of dollars, while sodomizing corrupt NZ government ministers, and got a preferential citizenship, too? “The Instant Kiwi” even forced the corrupt NZ government to have details of his immigration application redacted. NZ police recruitment video, copied from various old and tasteless promotion clips, doesn’t show how their assassins train and operate! SEVERE Negative Karmic Events Occurring Throughout NZ! ARE YOU READY? Evil Karma Boomerangs in Mysterious Ways! Welcome to the MOST HEAVILY CENSORED Blog in New Zealand [and in all other democracies that are populated by human corpses!] We’re GUILTY, of course, of REVEALING the TRUTH about our TOXIC COUNTRY, EXPOSING the GOVERNMENT CORRUPTION and police BRUTALITY, as well as UNMASKING a culture of VIOLENCE and WOEFUL INCOMPETENCE! We take credit also for exposing the Manuka Honey Scam, among others, to British media. WATCH THIS SPACE: YOUR LIFE MAY WELL DEPEND ON IT! “A body has been found during the search for the 57-year-old missing swimmer near Westport,” police said. A body was found at Anzac Bay, Waihi Beach this morning. Only five road fatality reports allowed by police over the weekend, despite at least eight fatalities! NZ police recruitment video, copied from various old and tasteless promotion clips, doesn’t show how their assassins operate! A magnitude 4.1 earthquake struck the Sewage City in the early hours of this morning. The quake struck 15km north-west of Wellington at a depth of 31km, Geonet said. What do we know about this woman, Jacinda Ardern, other than she sells/donates her used underwear, and has a silly name? What could she possibly be hiding, other than…? Ms Ardern has already demonstrated her inability to filling the massive moral void at the heart of this corrupt country. The PM-elect, will NOT set a good example for NZ youth, especially the young women, given her promiscuous lifestyle. The author supports neither Bill English, nor the National Party. WARNING: SEVERE Negative Karmic Events Occurring Throughout NZ! ARE YOU READY? Welcome to the MOST HEAVILY CENSORED blog in New Zealand [and all other ZOMBIE democracies!] We’re GUILTY, of course, of TELLING the TRUTH, EXPOSING GOVERNMENT CORRUPTION and police BRUTALITY, and a culture of WOEFUL INCOMPETENCE! The quake struck at a depth of 12km around 8:44 PM, today. WARNING: SEVERE Negative Karmic Events Occurring Throughout NZ! Welcome to the MOST HEAVILY CENSORED blog in New Zealand [and across all other ZOMBIE democracies!] We’re GUILTY, above all, of TELLING the TRUTH, EXPOSING govt CORRUPTION and police BRUTALITY! A strong earthquake measuring 6.1 magnitude struck 256km W of Auckland Island, New Zealand, according to the US Geological Survey (USGS). The quake was centered at 50.371°S, 162.550°E and struck at a depth of 10.0 km, earlier this afternoon. Minutes later, at 2:42 PM, a quake measuring 5.1 magnitude struck 30 km north-east of Seddon at a depth of 17km, Geonet said. The quake was centered at 41.48S, 174.34E, according to Geonet, which registered 3,429 felt reports, as of 3:40 PM. “The slow slips occurred within days of the 7.8-magnitude Kaikōura quake, 15km deep below seabed, and spanned more than 15,000 sq km off the Hawke’s Bay and Gisborne coasts,” according to a report. “One of the most intriguing factors is that the quake-triggered slow slip off the Gisborne coast [was] up to 600km away from its epicentre in North Canterbury,” said GNS Science’s Dr Laura Wallace. A massive sinkhole measuring 20 metres in diameter has been discovered on a council reserve between the Waihi Rugby Club and the Martha open pit, the council said. Ministry of Transport (MoT) outcons itself, police, spreading more fake data, disinformation: Can you believe anything the government tells you? Police say they have identified the driver of the vehicle that went into Auckland Harbour last night around 7:20pm. The man’s body was removed from the water, along with the vehicle, around 10:30pm last night. Five schoolkids hit on Wairau Road, North Shore. At least nine road fatalities occurred over the weekend (September 1 – 2), according to reliable insider information. However, only four of the deaths were reported by police, and of those, just three recorded by the Ministry of Transport. 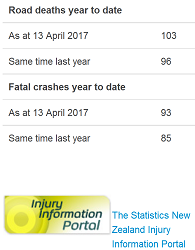 Of an estimated 2,000 people who have received near-fatal/critical/serious injuries on New Zealand roads so far this year, none has perished, according to NZ police reports, or lack thereof. Welcome to the MOST HEAVILY CENSORED blog in New Zealand [and across all other ZOMBIE democracies!] We’re GUILTY, above all, of TELLING the TRUTH, EXPOSING police BRUTALITY and govt CORRUPTION! Persistent rain and strong winds have triggered multiple landslips in Wellington overnight,”including one that forced a block of flats to be evacuated,” a report said. The organisms called nematodes, were found to be extremely hardy and could endanger the native wildlife, researchers said. Friday, September 1. No road fatality report allowed by police, today, as of posting, despite at least 16 known serious crashes that have been reported locally. The latest road fatality news blackout began four days ago. Tuesday, August 29. No road fatality report allowed by police, today, as of posting, despite at least 14 known serious crashes that have been reported locally. Update Monday, August 28. Only THREE road fatality reports allowed by police, today, as of posting, despite at least 15 known serious crashes that have been reported locally. UPDATE: Sunday, August 27. Only two road fatality reports allowed by police, today, as of posting, despite at least 17 known serious crashes that have been reported locally. Sunday, August 13. Only three road fatality reports allowed by police, today, as of posting, despite at least 18 serious crashes that have been reported locally. Several people were critically injured. But their fates will never be known because the true road toll is a closely guarded state secret. Sunday, August 6. Only three road fatality reports allowed by police, today, as of posting, despite about two dozen serious crashes that have been reported locally. One of the three fatalities was carried over from Saturday. Sunday, July 30. Only FIVE road fatality report allowed by police, today, as of posting, despite at least two dozen serious crashes that have been reported locally. “As many as four in five Christchurch primary schoolers are exhibiting symptoms of post-traumatic stress disorder (PTSD), a local study has found. “Children who started school in the years after the Canterbury earthquakes were “neurologically different” – and a city-wide focus on resilience has only deepened the crisis, researchers Kathleen Liberty and Maureen Allan found. “They were clingy, they cried at the drop of a hat, there was less readiness to learn, and there were so many runners,” Allan said. The Moderators are happy that their efforts lead to the British media questioning why the consumers were paying inflated prices for products containing little or NO mānuka. At least 4,000 overseas visitors, international students, foreign workers, recent emigrants and refugees have lost their lives and more than 24,000 others seriously injured in New Zealand between Jan 2000 and Jan 2017. All those Kiwis who remain silent are complicit in the mass killing of foreigners. If you believe Wellington deserves a major earthquake – centered right under the Beehive – because the government is too corrupt, incompetent and dishonest, drop us a line! Another “another day, another two dead bodies found in Zombieland” !!! Welcome to the MOST HEAVILY CENSORED blog in New Zealand [and across all other ZOMBIE lands!] We’re GUILTY, above all, of TELLING the TRUTH, EXPOSING police BRUTALITY and govt CORRUPTION! Two more corpses found, one in Waikato, the other in Auckland. A man in his 40s was found dead near a walking track in Auckland at the weekend, a report said. Yesterday (Sunday) evening at approximately 6.30pm a 47-year-old pizza delivery worker went to an address in Kelman Road, Kelston to deliver an order. The victim parked his vehicle and as he was getting the pizza out of his boot he was struck by an unknown object to the back of his head. The victim lost consciousness and fell to the ground. He was found about 15 minutes later by a member of the public with a serious head injury. The offender or offenders took off with $20 dollars and the pizza. Monday, July 10: NO road fatality report allowed by police, today, as of posting, despite at least 12 serious crashes reported locally. Update – Sunday, July 9: Only one road fatality report was allowed by police, despite at least nine serious crashes reported locally. Police have released the name of the woman who was killed in a violent collision in Kinleith, near Tokoroa on Sunday 9 July, 2017. She was 27-year-old Australian engineer Kirsten Maree Mann who moved to Napier last year. Two people remain in a [serious but] stable condition at Waikato Hospital. Another two occupants were discharged from Tokoroa Hospital yesterday evening, police said. 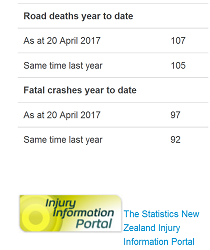 NZ Road Toll, as Doctored by Ministry of Transport (Minitru), Hits 200! Thousands in the Wellington region have reported feeling a 4.1-magnitude earthquake that struck the lower North Island at a shallow depth shortly before 7am, on Monday. The quake hit 25km south of Paraparaumu at a depth of 5km, according to GeoNet, which received 4,160 “felt it” reports, as of posting. Foreword: People who live in Wellington, Christchurch, Auckland, Tasman Bay and Hawke’s Bay regions are either very brave, or too desperate. 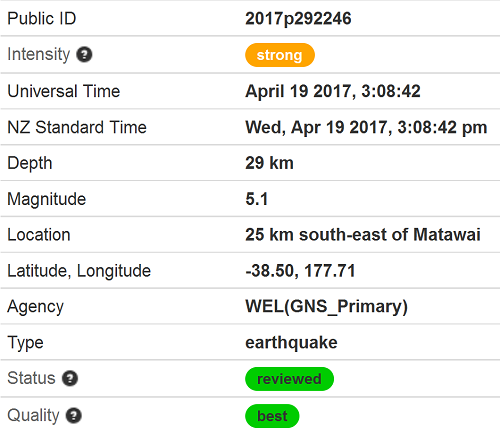 The quake struck at a depth of 39 km (± 6 km), some 15 km north-west of Wellington around 5:49 am this morning, Geonet said. Centered at 41.17S, 174.60E, the quake was reported by more than 2,500 people throughout the country. “What worries me isn’t inequality per se, what worries me is a minority of New Zealanders who basically aren’t getting a fair go,” said Derek Gill, principal economist at NZIER. Isn’t poverty an extreme form of inequality? “The data tells us that our current level of income inequality is actually the same as it was in the 1930s and 1940s,” said Mr Gill. Yes, Mr Gill. You don’t have to be a rocket scientist to understand that. As in the 1930s and 1940s, the poor continue to have NOTHING, while the rich have EVERYTHING! Saturday: NO fatality report allowed by police, as of posting, despite multiple serious crashes reported locally. Friday: ONLY one fatality report allowed by police, as of posting, despite at least 10 serious crashes reported locally. Thursday Update: ONLY two one fatality report allowed by police, as of posting, despite at least 11 serious crashes reported locally. Wednesday (updated): ONLY one fatality report allowed by police, as of posting, despite at least 8 serious crashes reported locally. Tuesday: No fatality report allowed by police, today, despite at least 9 serious crashes reported locally. Monday: Only two road fatality reports were allowed by police, today, as of posting, despite at least 11 serious crashes reported locally. Sunday: No fatality report allowed by police, despite at least 7 serious crashes reported locally. Saturday: Only EIGHT road fatality reports were allowed by police, as of posting, despite at least 22 serious crashes reported locally. Correction: A person was killed after been being hit by a train. “The New Zealand Qualifications Authority (NZQA) is continuing investigations into an Auckland tertiary institution where business tutors gave students the wrong marks. 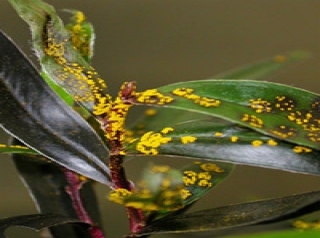 “Four further Taranaki properties have tested positive for myrtle rust, bringing the number of positive locations nationally to 12. “At this time, the disease has only been recorded in 2 regions – Northland and Taranaki. 8 of the affected properties are plant nurseries or retailers/distributors, and it has been detected in four private gardens. At least five foreigners have been killed in vehicle-related crashes in New Zealand recently. The fatalities include two Singapore nationals, two Samoans and one Aussie. No vehicle related fatality reports allowed by police on Tuesday, despite multiple serious crashes. Only three vehicle related fatality reports allowed by police on Monday, including a road kill that occurred on Sunday. See below for officially doctored road toll so far this year. CORRECTION: The two tourists killed in the crash on Main South Road, Bankside, Canterbury on Thursday 4 May, 2017 were 29-year old Ms Ong See Yee and 38-year-old Mr Chin Tze Hau, both from Singapore, police said. They were 29-year old Ms Ong See Yee and 38-year-old Mr Chin Tze Hau, both from Singapore. The man killed in a crash near Elephant Hill, Waimate on Saturday 6 May was 31-year-old Ryan Stuart from Australia, police said. A 4.7 magnitude earthquake hit 10 km south-west of Te Kaha, Geonet said. The earthquake was centered at -37.79, 177.59, the quake struck at a depth of 31km, just before 6:20 pm. Some 319 felt reports had been received as of 11:50pm, according to their website. ONLY one vehicle-related fatality report allowed by police today, as of posting, despite a string of serious crashes that have been reported locally. Based on insider information, statistical models and local news, We believe about 900 people were killed and 8,000 others seriously injured on NZ suicide roads in 2016; however, only 328 fatalities were reported last year. Welcome to the Wild, Wild South! Hee! Ha! Two women, believed to be mother and daughter, were shot and injured at a residential property on Newtons Road in Rolleston, Christchurch, around 10pm last night. Both victims are in now Christchurch Hospital with serious injuries, police said. http://www.police.govt.nz/news/release/two-injured-rolleston-shooting. “Armed police are attending a robbery of an Armourguard van outside the ASB bank near the corner of Dominion Rd and Mt Albert Rd in Auckland. 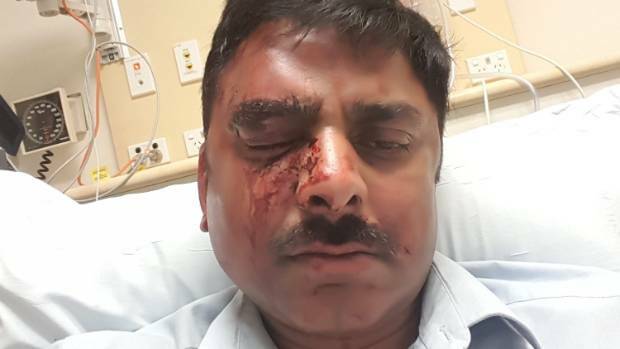 An Indian taxi driver who was assaulted in his cab by three men is being blocked by his employer from seeing the security video footage of the attack on him. “Vineet Mahajan was assaulted on Tuesday morning when he refused to drive the trio. Jim McWilliams, managing director of Taxis United, Mahajan’s employer, says he has “no problem” with the driver viewing the footage but insists the law was that only the Police and the company were allowed access due to privacy concerns,” said a report. A fatal crash that occurred on Te Anga Road near Waitomo earlier today when a truck flipped at 10:50 this morning killing the driver, police said. A 16 year-old local boy who had gone for a run was hit by a train and killed early this morning at Ranui Train Station. “Police have reviewed security camera footage over the tracks. Tragically, it appears that the young man has been wearing headphones and has been unaware of the train approaching as he crossed the tracks,” police said. Thousands of pests and diseases continue to slither, crawl and make their way to New Zealand in imported goods. “International online gamers allegedly defrauded by a Blenheim man say they are frustrated police do not seem to be taking their concerns seriously. The group of gamers say a group member, Jeffrey Meikle, tricked them into thinking his house had been flattened by November’s Kaikoura earthquake,” said a report. A strong earthquake rattled the top of the South Island early early this morning, followed by several aftershocks. The 4.6 magnitude quake occurred at 4.13am, centred 30km northeast of St Arnaud at a depth of 7km, GeoNet said. At least 323 felt reports were received within an hour or so. “That quake was followed by a magnitude 4.0 quake in the same area at 4.51am at a depth of 21km, then a magnitude 3.0 at 10km depth, a magnitude 3.3 shake at a depth of 10km at 5.11am, and a magnitude 3.6 aftershock at 5.34am at a depth of 13km,” said a report. Compensate the victims of NZ Tourism, false advertising, clean and green lies… or pay the ultimate price the karmic way! Update: Geonet experrrts say the strong quake that shook Gisborne was “moderate” in intensity, despite an earlier review. Okay! There were 776 felt reports between as far south as Christchurch, and Auckland in the north, as of writing, according to Geonet website. Compensate victims of NZ Tourism, false advertising, clean and green lies… or pay the ultimate price the karmic way! Murder mystery, negligent homicide, death by drowning or suspected suicide? The man who was killed in a violent crash on the Riverton-Wallacetown Highway, Oporo, yesterday morning was Conor Drake, 21, who lived in Otautau. The man who was killed in a violent crash on Taylorville Road near Greymouth on Thursday 13 April 2017 was Kenneth Naismith Buchanan who lived Greymouth. Auckland teen died in his university dorm bed: Suspected seizure? The family of a 17-year-old Auckland student, Jack Bisset, who was found dead in his dorm room at City College in Dunedin, University of Otago, on Saturday, say he had been loving student life. His father, Dr. Aryan’s father, Anjan Banerjee, says Taradale Primary School, the Napier school responsible for his son’s death [at the very least negligent homicide] spent “ridiculous” amount [Ministry spent $46,842.54 on legal fees for the school, under “special reasons funding”.] to cover their backsides. Dr Banerjee said his family had to pay own legal bill, of more than $9000 to Nigel Hampton QC, to represent them. “It isn’t a fair playing field, it never has been, never will be – because there are people with more money. The Ministry has more money. “Neither the [racist] police or [racist] Worksafe laid charges, and the family ran out of time to file a private prosecution over the death,” said a report. 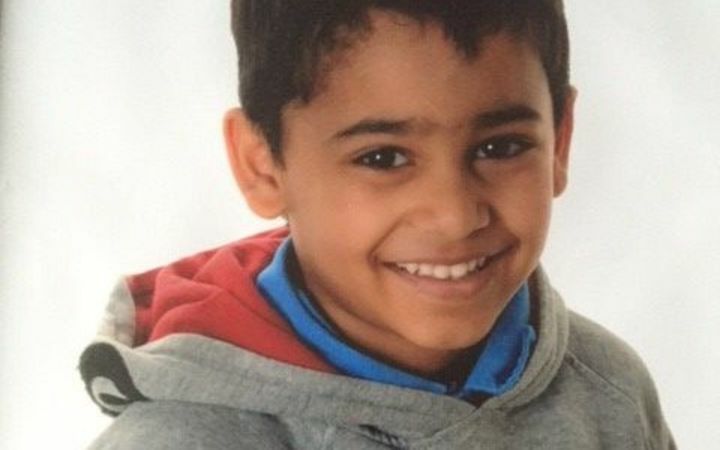 Those directly involved in the 9-year-old’s death, the caretaker and Aryan’s classroom teacher, have been granted permanent name suppression, of course, by the frigging old whore, the utterly corrupt New Zealand justice system. At least 600 people had reported felling the quake. However, it was described as “moderate” by Geonet.